Buying a gift for your child can be very hard, so what about something different and unusual. This page will be dedicated to electric scooter deals for kids of all ages in time for Black Friday UK discounts. Christmas, birthdays, no matter what the occasion scooters are very popular toys in the shopping market. There are many types of electric scooters to choose from such as standard stand up ones, seated, kick, stunt and three-wheeled scooters. They are very sturdy, ergonomically designed and fairly safe dependent on how your kids ride them. If your child is going to use for long periods then the seated models are more comfortable, but it depends on what you want, style, cost etc. Scooters for kids can reach up to speeds of 15 mph; this can be a lot lower for younger kids. Some of the most popular kids scooters on the market include the Razor E300, E100, One Direction 24V model with a seat, plus the Chad Valley 6V and Zinc Volt 80 E. If you have found an electric scooter deal please do list it below. Smyths is selling the Razor Power Core E100 Electric Scooter in different colours with £20 off, they are now £149.99. Argos has a half price sale on the Zinc Volt GT Electric Scooter. price is now only £79.99. I hope Amazon will sell some kids scooters during its Black Friday 2016 UK sale. I can see many deals already showing on Amazon but i am one of those if i can save a little more then thats better for me. I am already liking the reduced Electric E Scooter Ride on Rechargeable Battery for only £63 reduced from just under £100. Tesco Direct online is selling a blue ride-on 3-wheel scooter for first time riders for £7.50, this is now the half price price. The product number is 573-0781 – enjoy. Shop Argos right now and get a great deal on the Zinc Volt GT Electric Scooter. , priced normally at £119.99 you can get for half price at only £59.99. No idea why that done that, but its supposed to say get £46.44 (17%) of lol. (17%) off the Matt Grey Razor E300 Electric Scooter, you need only now pay £233.55. 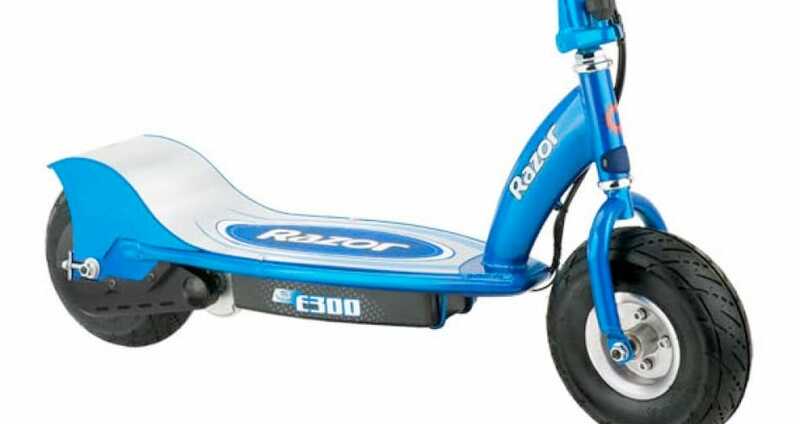 I would always stick with Razor scooters, they are the best by far, they last longer and batteries are much better. I am so close in buying the Homcom Electric E in pink, but have never heard of this model before. Its only £65. I bought my son the Razor E100 in silver and only paid £140 from Argos.